Protecting the environment is of importance to us all. First General Property Restoration Services has taken on the challenge of doing what they can to help reduce their environmental footprint. They are looking closely at how they, as a company can make a difference, and are committed to using more sustainable products whenever possible. One easy change First General is making is eliminating their use of plastic bags. 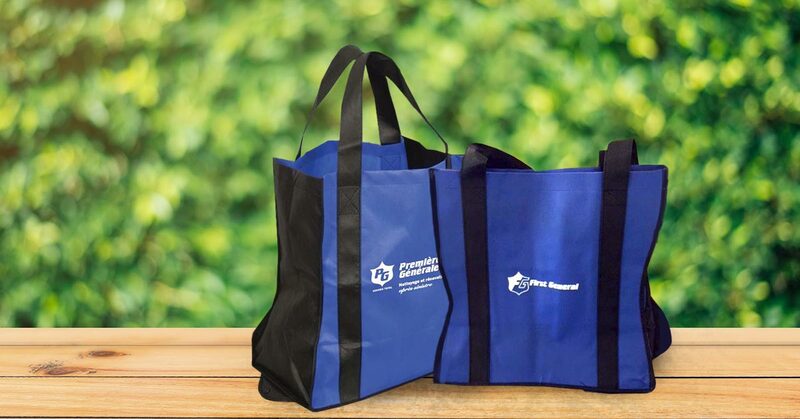 They are providing reusable canvas bags to all First General technicians and employees across Canada. They will use these bags rather than plastic ones whenever they purchase supplies, tools, and other items for their projects. This one simple step should help eliminate approximately 78,000 plastic bags per year from entering the landfill. A single plastic bag will take approximately 1,000 years to degrade. Every plastic bag that has ever been made still exists in some form or another on this planet. The Great Pacific Garbage patch that is floating in the Pacific Ocean is mostly composed of plastic. It is approximately twice the size of the state of Texas. Can't view .PDFs? Download Adobe Acrobat.